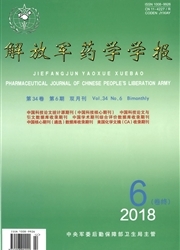 摘要 目的对泽兰(Lycopus lucidus Turcz.)化学成分进行研究,分离并鉴定化合物.方法采用现代层析分离技术进行化学成分的分离,根据理化性质和光谱方法确定所分离化合物的结构.结果分离得到6个化合物,分别为2α-羟基熊果酸(VIII),胡萝卜苷(IX),原儿茶醛(X),原儿茶酸(XI),咖啡酸(XII),迷迭香酸(XIII).结论以上化合物为泽兰的品质评价和开发利用提供了依据. Aim To study the chemical components from Lycopus lucidus Turcz and to find out the active constituents of the plant.Methods Modern chromatography was used to isolate chemical components and the compounds isolated from Lycopus lucidus Turcz were identified by spectral methods.Results Six compounds were isolated and identified as 2α-hydroxylursolic acid (VIII),daucosterol (IX),protocatechualdehye (X),protocatechuic acid (XI),caffeic acid (XII),rosmarinic acid(XIII).Conclusion Those compounds provided the basis for the quality control and further development. 7曹琳 ,袁海龙 ,李仙义 ,赵艳玲 ,方芳 .抗乙型肝炎病毒药物的作用机理研究进展[J].解放军药学学报,2004,20(5):370-372.